With summer in full swing and fall rapidly approaching, now is the time for a weekend retreat. 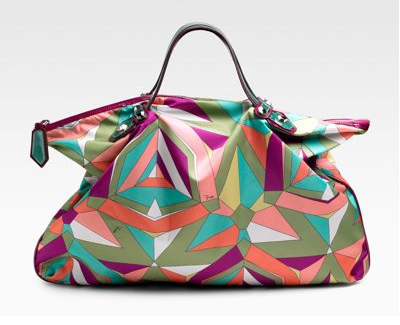 Travel in style with Emilio Pucci's 'Large Print Weekend Tote' ($840). Emilio Pucci has been synonymous with bold, brightly colored graphic patterns with a kaleidoscopic, slightly psychedelic effect. It is accented with two-tone purple and teal patent double top handles and matching purple lining. This nylon oversized, jewel-toned print bag is the perfect accessory for all your travel essentials.